The Kansas City Metro area is located in a part of the U.S. that has significant potential to experience extremely hot and cold temperatures throughout the year, thus exposing properties to heavy rainfall, humidity, Arctic blasts, and cold spikes. To protect your home or business from becoming impacted by a ice dams, pipe burst, flooded basement, and water damages, property owners can rely on the technicians at 911 Restoration of Kansas City Metro to provide them with quality and affordable water restoration services. Whether you’re suffering from water damage, mold contamination, sewage backup, or natural disasters that cause property damage, the IICRC certified professionals are available 24/7/365 to assist you. Bringing talent and knowledge to each job is as crucial as quick timing. 911 Restoration of Kansas City Metro prides itself on their 45-minute response time and same-day services. Beyond a speedy response time, the water damage restoration experts are available around the clock to take on any water-based disaster that a property owner may encounter. In addition to our exceptional customer service from start to finish, we strive to arrive early and implement the most professional, high-quality, flood damage restoration work possible. The emergency flood cleanup crew serves the entire Kansas City Metro area, including Overland Park and Springfield. So, if your home or business has experienced water damage due to a frozen pipe burst or flooded basement, then contact us today! Taking on the challenges presented by a flooded basement, frozen pipe burst, or ceiling leak is what 911 Restoration of Kansas City Metro does best. The technicians we employ are licensed, bonded, and insured and will work day and night to mitigate water damages. To prevent further losses and increased costs during an emergency water damage crisis, it is absolutely critical to act quickly. This is exactly why we provide our 45 minute arrival guarantee. Not only will immediate water remediation reduce the severity of the water damage, but it will also reduce the chances of mold and mildew problems later. Flooding cleanup, water extraction, drywall repair, and structural drying services will significantly reduce water damage restoration costs and further minimize property damage. Call 911 Restoration of Kansas City Metro as soon as you discover water damage in your home or business, and we will schedule a free visual inspection for property owners right away. The freezing winter temperatures are known to create ice dams and frozen pipe bursts that may result in flooded basements and other water damage emergencies throughout the property. When a frozen pipe cracks, the water inside will spray out at an alarming rate, allowing hundreds of gallons of water to flood your home. 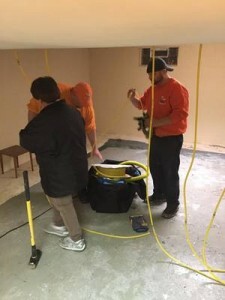 A flooded basement is the most common issue that arises from a pipe burst, and these situations are usually severe enough to warrant the need for emergency flood clean up services. The water remediation team specializes in flood damage restoration and has the ability to provide you with these services immediately. Our same-day services include pack-out and storage services, which is usually needed if your basement contains furniture and other items. Once your personal property is removed and safely stored away, we will extract the water from your flooded basement and proceed to dry out the area completely. The repair techs will also inspect the drywall and repair any water damage present. Call 911 Restoration of Kansas City Metro when you face an ice dam or frozen pipe burst in your home or business and we will provide you with quality and affordable flood damage cleanup services you need to make a full recovery. The humidity that the Kansas City Metro area experiences during the summer lends itself to the creation of mold infestations in homes and businesses in the surrounding cities. 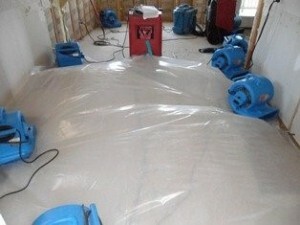 Proper mold removal is more than just cleaning mold on drywall or wiping mold off the ceiling. It not only takes the skill and knowledge of a trained, mold restoration specialist but also requires the proper tools and equipment to contain the infestation. Living in a mold-infested house can be dangerous to your health, especially if you have a mold allergy. This health risk is why our mold experts implement meticulous mold cleaning services that will remove every trace of an infestation from your property. 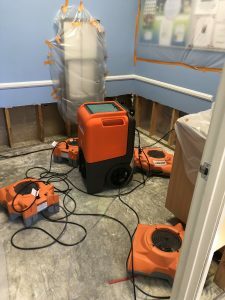 This expertise is the result of thousands of hours in the field dealing with indoor mold infestations, many of which included the need for water damage restoration services. Our professional mold removers always integrate water restoration into their mold remediation work, making us the only restoration company you will need to hire. So, call 911 Restoration of Kansas City Metro for local and inexpensive mold removal services today. A sewage spill inside of your property is a serious issue that needs to be dealt with by a professional sewage restoration team. Sewage is classified as black water because it is filled with toxic waste, bacteria, and viruses that can lead to significant health issues. Black water issues primarily are the result of a toilet overflow or sewer line backup and need to be mitigated with the utmost care. Individuals can risk being exposed to harmful contaminants if they aren’t wearing the proper protection. The sewage restoration team is not only trained to handle the black water extraction but is also qualified to implement water damage restoration and decontamination services. Like any other type of water damage, sewage can result in mold growth if not correctly extracted and thoroughly dried, which is why our sewage cleanup techs are also trained in professional mold removal services. Sewage restoration needs to be administered by our technicians to avoid spreading diseases and contaminating other parts of the home or business, so call 911 Restoration of Kansas City Metro today. A fire can engulf a part of your home or business within a few minutes and create significant fire and smoke damage throughout the entire property. In addition to damage caused directly from a fire, there is also secondary water damage that remains after the fire is extinguished. Many property owners are shocked at the amount of water damage created by the fire department and quickly become aware of the need for flood damage restoration services. By hiring our technicians, you can rest easy knowing that you will be provided with full-service restoration work that includes both water damage and fire damage restoration services. When it comes to fire damage restoration, we leave no stone unturned. The repair techs will clean up any smoke stains, remove smoke odor, and even check to see if the water damage has caused any mold growth in the property. For comprehensive fire damage restoration services call 911 Restoration of Kansas City Metro today. The disaster restoration team in Kansas City Metro understand that fastidiously tending to the challenges created by a disaster is key to successfully alleviating the effects of a flood, fire, or any other natural event. Be it a tornado, rainstorm, or a localized flood, the water damage technicians are prepared to spring into action on a moment’s notice to begin repairing any damage done by these disasters. To give you peace of mind during such an event, we stay open around the clock to administer disaster restoration services right when you need them. The repair techs work with home and business owners to provide them with the most affordable price possible for the services they need. We take all types of insurance and will even file your claim for you. If your home or business has been affected by a flooding incident or any other disaster, call 911 Restoration of Kansas City Metro today. We will show you how we can turn a disaster into a Fresh Start.